« The Daring Bakers’ February 2012 Challenge: Quick! Gimme a Flavour! 4th birthday – Merry Go Round! The birthday girl and I had many, many discussions about what birthday cake she would have for this year, her fourth birthday. For a long time she was certain that she wanted Foofa from Yo Gabba Gabba, which was achievable. However, she then got distracted by almost every other cake in the Womens Weekly Children’s birthday cake book (ie the birthday bible) so I ended up just picking the one she picked out first. The recipe noted that it was time-consuming but not necessarily difficult, which turned out to be the case. The hard part was trying to get the upper layer to balance, which is where the handy engineer husband stepped in – thanks handy husband! Overall, I was pretty happy with the result. Sure, it looks homemade and rough and like it was finished off in a rush in the 15 minutes before the guests arrived, at which time I was still wearing my running clothes. But that’s because it was. 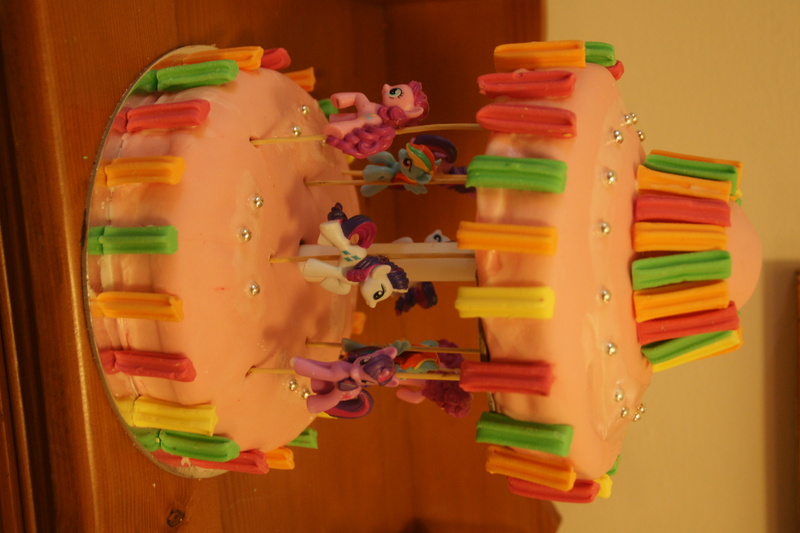 The horses are My Little Pony horses, glued on to skewers. I was a bit worried I would have to drill holes through them and impale them, but luckily we avoided that. And 8 little girls got to go home with a “unicorn” (as they were promptly proclaimed), as well as a massive sugar high. Happy, happy day. You’ll have to give me lessons in birthday cake putting together! You are going to have SO much fun! I can’t wait to see what you come up with. what a lovely blog you have! 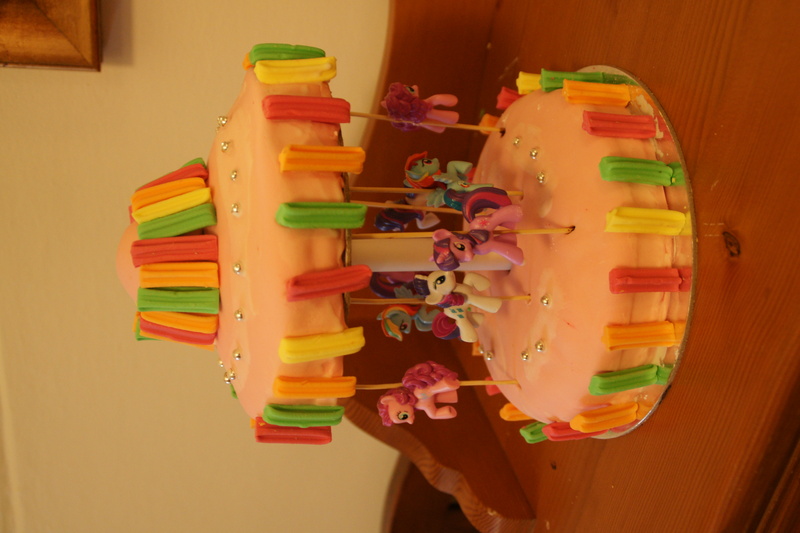 My 2 girls would just drool if they saw the My Little Pony cake – it is so cute! Way to go!! I am 5 days away and need to make one of these! Eek! How did you do the top layer and hold it in place? And how did you make the very top of it too? Thanks for your posts! Hi Wendy! I was lucky – I have an engineer for a husband and he took care of attaching the top layer. According to the book you were meant to be able to just balance the top layer (on a cardboard circle) on top of the sticks but I just found this to be impossible. We punched (tight) holes through the top layer and poked the skewers through. If I did it again I would use thicker sticks/skewers for more stability. It actually didn’t wobble very much once it was all put together – thankfully! The part on the very top is a muffin just stuck on with jam. Good luck!